I knew I was going to be snacking watching the game, so I went to the health club that morning and did 30 minutes on the rower to put an extra 300 calories into the bank. I also had a small but reasonable lunch to leave room for snacks. As it turned out that wasn’t even close to enough. Well, I went to a Super Bowl party. There was good company, good conversation, a good ball game and really good snacks. To start with, because I was enjoying everything mentioned above, I got carried away with the salty snacks. 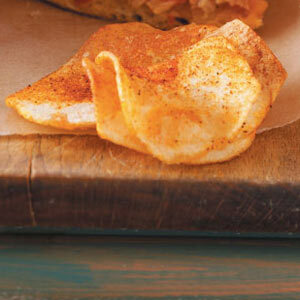 Rippled potato chips and a bowlful of delicate savory potato crisps. There were also some wonderful little hot dogs called Lil Smokies. Enjoying these savory snacks, of course, I had to wash them down with a beer and glass after glass of soda. I remember thinking the soda glass didn’t hold very much because I had to keep refilling it. The fact is, I completely lost my focus. I was so into the experience of the afternoon, I didn’t pay attention to how much I was eating and drinking. Mindful eating, anyone? I certainly wasn’t practicing it. This carrot sticks not pretzel sticks or potato chips. It began to dawn on me when dinner was served and I filled up my plate with Italian sausage, meatballs and stuffed shells (a variation on lasagna). I actually felt so full that I had trouble finishing my dinner. I never feel that way. My overindulgence was twofold. Because I ate all those salty snacks, I had to drink a ton of soda. Not smart and more not smart. The next morning I tipped the scale at 154.9 lbs, that is 2.8 lbs more than on Super Bowl morning. Because I weigh myself daily, I knew that while I had eaten a lot, I hadn’t eaten that much more. Remember, fluctuations in daily body weight can also reflect elimination and water retention. I am sure I had retained water with all that salt and diet soda. Two days later, I was back down to 152.5 lbs, a much more reasonable number. I love to watch football. I am plugged into the NFL from the summer preseason games through the Super Bowl and I follow off the field NFL developments all year. So, today is a real culmination for me. I was surprised to learn that in terms of total amount of food consumed, Super Bowl Sunday is second only to Thanksgiving. Wow! I have seen some estimates of the tons of pizzas and beers that will be consumer eaten and drunk today. Staggering. Papa John’s and Domino’s must love it. So, it seems like the Super Bowl presents a potential roadblock to someone working on weight control. Here is how my day looks: I just came back from a 15 mile bike ride. You may have heard that Chicago is flirting with blizzard conditions today. That is true but I ride on the lower level of Wacker Drive which is covered. You may not have heard of lower Wacker, but you have likely seen it. Christian Bale wheeled his Bat mobile all over it in the Batman movie. So, I feel that I have paid for some of the extra snacking I will be doing come game time. A lot of folks go to Super Bowl parties to enjoy the game. My girlfriend and I are planning a two-person party complete with all the goodies. Since there is so much snacking over the course of the afternoon, the game starts at 5:30 PM, Chicago time, we thought we would start watching and snacking at 5:00 PM. Here are some of our Super goodies. We plan to simply snack through the afternoon and game and forgo any kind of dinner. This frees up around 400 calories for the festivities. Interestingly, our choices mostly came from our neighborhood Costco. We will have Sabra hummus and pita bread which is delicious and a very healthy item. There will also be toasted seaweed and Edamame (a soybean snack). The Energy Blend Snack, a mixture of cranberries, nuts, soybeans, etc. Only the nice dish of tamari roasted pepitas will be from Whole Foods. 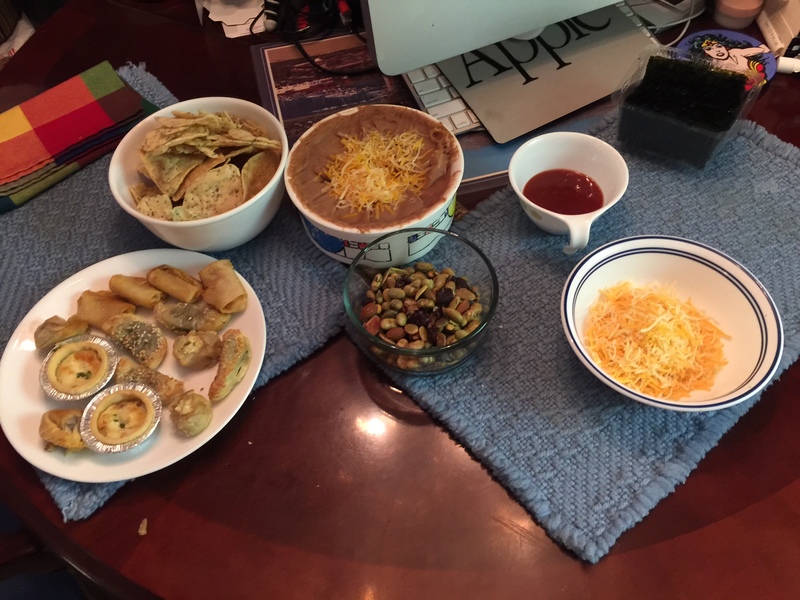 She is bringing some fancy hors d’oeuvres in addition to nachos and halfway healthy chips for dipping. I fell for the Bud Light Lime ads back when they first introduced it, so I will be drinking Bud Light Lime beer. My girlfriend who is infinitely classier than I, will have wine. You will notice that I haven’t spent a lot of time with calorie counts. I think this is definitely a celebration day and if you go over some on your calorie, you go over and that’s okay. I don’t want to spoil the fun. I know you can eat healthy and still have a good time. “This Sunday, Americans should be more concerned with over-inflated bellies, not under-inflated footballs,” said CSPI executive director Michael F. Jacobson. As far as food consumption goes, Super Bowl Sunday is second only to Thanksgiving for the amount of food eaten, according to the U.S. Department of Agriculture. WASHINGTON–There’s no rule that your Super Bowl party has to feature boring sporting-event staples like chicken wings, pizza, chips, and soda. With that in mind, the food detectives at the Center for Science in the Public Interest, publisher of Nutrition Action Healthletter, are recommending delicious recipes and packaged foods for Super Bowl entertaining that offer a break from the same old high calorie, salty, fatty, sugary, and over-processed party fare. • Veggies Hummus. Make your own hummus. Or buy a packaged brand like Sabra, Tribe, or Athenos. Serve with platters of baby carrots, red pepper slices, cherry tomatoes, or snow peas. A typical hummus has about 50 to 70 calories per two-tablespoon serving. • Chipotle Chicken Lettuce Wraps. Need a substantial finger-food? The recipe, developed by Nutrition Action culinary director Kate Sherwood, is a great alternative to wings. Flavored with garlic, chipotle pepper in adobo sauce, and orange juice, these lettuce wraps are garnished with scallions and slivered tortilla chips. 400 calories per serving. 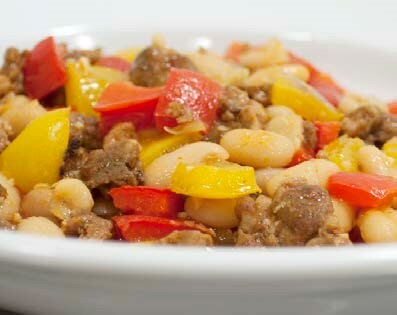 • Cannellini Beans & Chorizo. Instead of a big vat of chili con carne, consider Sherwood’s 5-ingredient, 20-minute recipe for white beans and chicken or turkey sausage. This dish keeps sodium under control (370 mg) and packs 6 grams of fiber for just 300 calories. • Clementines. Put out a big bowl full of sweet, easy-to-peel, and kid-friendly clementines (or other variety of mandarin orange). Halos and Cuties are two brand-name varieties of these little seedless, citrus gems, typically sold in bags or small wooden crates. Each has around just 40 calories and a gram or two of fiber. • Flavored waters. Instead of soda, consider seltzer water spiked with fruit juice, or if you’re more ambitious, pitchers of spa water flavored with slices of citrus fruits, cucumbers, herbs such as basil or mint, and berries. Snacking aside, CSPI also criticized the National Food League for letting PepsiCo sponsor the halftime show, and celebrities like Katy Perry, Kid President, and Danica Patrick for promoting sugary drinks, which cause diabetes, heart disease, obesity, and other serious health problems. I am writing this as a warning: Don’t let this happen to you. The fact is, I completely lost my focus. I was so into the experience of the afternoon, I didn’t pay attention to how much I was eating and drinking. Mindful eating, anyone? I certainly wasn’t practicing it. The next morning I tipped the scale at 154.9 lbs, that is 2.8 lbs more than on Super Bowl morning. Because I weigh myself daily, I knew that while I had eaten a lot, I hadn’t eaten that much more. Remember, fluctuations in daily body weight can also reflect elimination and water retention. I am sure I had retained water. This morning, the second day after the Super Bowl, I was back down to 152.5 lbs, a much more reasonable number.